The 60 officers include 48 embassy and consulate officials and 12 Russians working at the Russian mission to the United Nations, said administration officials who briefed reporters on the action. "The individuals who are being sent back to Russia are intelligence officers being cloaked by diplomatic positions here in the U.S., and are considered to be aggressive collection personnel here in the U.S.," said a senior official. Additionally, the administration ordered the closure of the Russian consulate in Seattle over concerns Russian intelligence officers were using the facility to spy on the movements of U.S. ballistic missile submarines transiting from the Navy base at Bremerton, Washington. The Russians also were spying on major defense contractor and aviation giant Boeing. The White House said in a statement that President Donald Trump ordered the expulsions. "The United States takes this action in conjunction with our NATO allies and partners around the world in response to Russia's use of a military-grade chemical weapon on the soil of the United Kingdom, the latest in its ongoing pattern of destabilizing activities around the world," the statement said. "Today's actions make the United States safer by reducing Russia's ability to spy on Americans and to conduct covert operations that threaten America’s national security." The expulsions came in response to the clandestine Russian intelligence attack March 4 against GRU military intelligence defector Sergei Skripal and his daughter Yulia Skripal in Salisbury, a town west of London. British authorities said the Skripals were attacked with the nerve agent sometime during a dinner meeting. Both remain in critical condition. "This was a reckless attempt by the government to murder a British citizen and his daughter on British soil with a military-grade nerve agent. It cannot go unanswered," said one senior administration official. "To the Russian government, we say when you attack our friends, you will face serious consequences," the official said. Officials declined to identify the services of the Russian spies. The three main services are the Federal Security Service, known as FSB, the SVR civilian spy agent, and the GRU military intelligence. About 100 Russian intelligence officers are currently operating in the United States, and once the 60 officers leave within the next week, 40 will remain. During a similar mass expulsion during the administration of President Ronald Reagan in the 1980s, the expelled Russian officers were identified by name and service, then the KGB and the GRU. A second senior official said the expulsions and the closure of the Seattle consulate "will help curtail Russia's increasingly aggressive intelligence activities that we see every day here in the United States." "Additionally, with the expulsion, Russia's collection capabilities in the United States will be significantly minimized," this official said. Russia uses its diplomatic facilities for conducting intelligence collection and engaging in "destabilizing activities in the U.S. and around the world," the official said. "They hide behind a veneer of diplomatic community while actively engaging in intelligence operations that undermine the country in which they are hosted and the democracies they seek to minimize," he said. The expulsions will "be a step in making the Russian government accountable for the diplomats they pose in the countries they are hosted," the official said. A senior counterintelligence official said the expulsions are "a very significant action taken by the United States government to expel 60 known intelligence officers by the Russian intelligence services." "It is true that there are more that remain here, but this is the first step, and the U.S. reserves the right to take further action in the future." The FBI's counterintelligence mission of tracking and neutralizing foreign spies "will be greatly enhanced with the elimination of these 60 intelligence officers, to allow them to provide more protection of the American people, its data, its information, by having a reduced number of intelligence officers here in the U.S."
Fourteen European Union nations followed the American action in expelling Russian spies, including Germany, France, Poland, and Ukraine. Last week, Britain ordered 23 Russians out of the country. Asked about closing the consulate, a senior official said the diplomatic outpost was "part of this broader problem of an unacceptably high number of Russian intelligence operatives in the United States." "We think it sends a very clear signal, particularly since on the West Coast, the Russians will now have a degraded capability with regards to spying on our citizens," he said. "We are prepared to take additional steps if necessary, but we believe at the time, under the circumstances, this sends the message that's needed." Russia in the past had established a network of deep cover operatives, known as illegals, who could take over when mass expulsions of spies using diplomatic cover took place. However, in 2010 a network of 10 Russian illegals were caught and expelled, severely crippling the Russians' illegal spy network. U.S. officials have said that operation was facilitated by the defection of the head of the Russian illegals spying program. Russia was notified of the action through diplomatic channels. One official said that if Moscow retaliated by expelling U.S. diplomats from Russia, "we do reserve the right to respond further to any Russian retaliation against our entirely justified action today." Officials would not say whether the nerve agent used in the Salisbury attack was Novichok, a deadly chemical nerve agent. Samples obtained from the victims, however, are being turned over to the Organization for the Prohibition of Chemical Weapons, as part of the ongoing investigation into the attack. Russia has requested samples but will not be provided with any. "Sharing samples with Russia would not provide further clarification on the origin of the agent used in the attack," one official said. 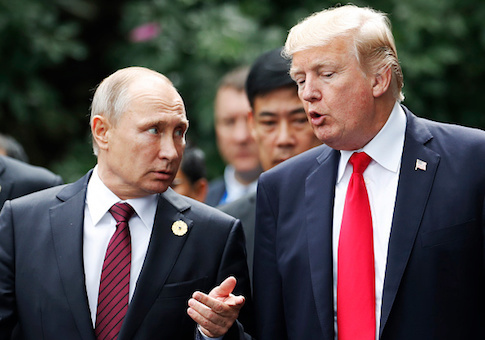 "And let me also say, Russia has had nearly a month at this point, and instead of explaining, has engaged in the usual obfuscations that we've seen from them in the past." Russia leader Vladimir Putin has been linked to another assassination by poisoning. In 2006, Russian agents in Britain slipped a deadly radioactive poison, Polonium 210, to FSB defector Alexander Litvinenko. He died 21 days later. A British investigation later determined that Litvinenko's killing was probably ordered by Putin, a former KGB political police officer and intelligence official. Russian officials openly praised Litvinenko's killing. Russian intelligence also has been linked to other killings, including those of journalist Anna Politkovskaya and opposition politicians Sergei Yushenkov and Vladimir Golovlev. All were shot. Officials declined to say whether Putin would be sanctioned in the future. This entry was posted in National Security and tagged Russia, Trump Administration, Vladimir Putin. Bookmark the permalink.